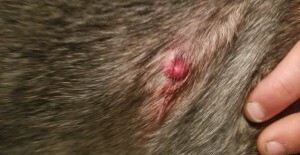 My poor dog has an lump on his side about the size of a quarter, it's hairless and he is now trying to scratch at it. When I first noticed it about a week ago, it was just scabby and raised, but now he has scratched the scab off and it looks so irritated. I've been putting Neosporin on it, but I'm not sure if I should take him to the vet or if it is something that I could treat at home. Other than the itching, he is still acting completely normal. He is also only 9 month old and he's a mutt. He's a mix of with Rottweiler and Pit Bull. The picture I uploaded is right when I noticed that he had scratched it raw and it started bleeding so it looks worse than it normally does. Any skin change, whether on an animal or human, should be checked out by a doctor. Take the dog to the vet. Ouchies!! Poor pup!! I am all about safety first and any skin changes off to the vet we go (or our vet is awesome and sometimes we can send her a pix and she gives us the thumbs up--bring him in or the OK to treat at home. Prayers for healing!! Post back what you learn!! I do not take any chances with skin conditions. A photo cannot tell you what this may be. You really need to see your Vet and I wouldnt wait.